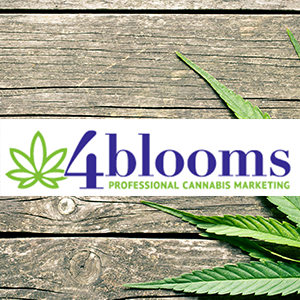 San Diego, CA / MJBizwire /August 24, 2016- 4blooms, a marketing agency devoted to cannabis industry clients, is proud to announce its launch, and is marking the occasion by offering free microsites to drive sales to two lucky companies. 4blooms is San Diego’s first marijuana-specific marketing agency. 4blooms will work with businesses involved in all aspects of the cannabis industry across the U.S., from growers to dispensaries to smoke shops. The 4blooms team consists of marketers with international experience across numerous channels and industries, including the cannabis industry. Founder Susan Rust has enterprise experience with CMS applications like Drupal and WordPress. To help budding companies with their technology stack, 4blooms will offer high-quality scalable hosting, API integration with POS and websites, and web development for brochure, membership and commerce applications. As part of the launch, 4blooms will randomly select two companies from those who request a marketing quote. Each will receive a free microsite to increase online conversions. 4blooms is excited to offer its services to a fast-growing, inspiring industry and is proud of California’s integral role in the development of the current marijuana climate. In 1996, California became the first state to legalize marijuana for medicinal purposes. In November, California voters will vote on Proposition 64, which will legalize recreational marijuana if approved, opening the door to countless new business opportunities. More about: 4blooms, visit https://www.4blooms.guru or call (866) 420-6464. About Company: 4blooms is a cannabis marketing and lead-generation agency based in Southern California. 4blooms works with stores, dispensaries, growers and other cannabis industry businesses to increase online visibility and generate sales.